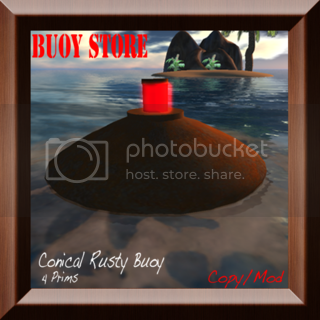 Khargo: Furniture and Design: Buoys Ahoy! Not your average buoy, this was old and rusty and dilapidated with a definite list to one side. And, just because we could, we put it for sale on xstreet. And there it languished for quite a while... occasionally someone would buy one but mostly it just lurked at the bottom of our list of items. 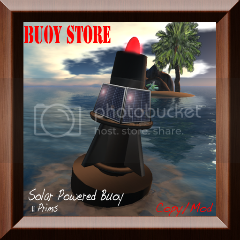 Of course, this wasn't helped by the fact I can't spell the word 'buoy' and had it marked as 'bouy' instead. Yet still, people managed to find it :) Recently, prompted by a surprising rise in sales (and the fact I finally cottoned on to the spelling) we decided that it really needed an update. Add to this we had some spare prims lying around at the store and Ke wanted to improve on his original build. 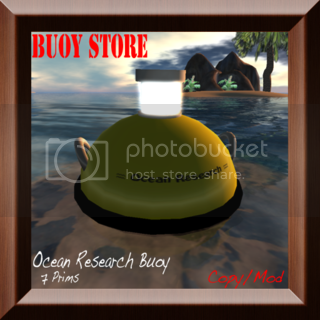 So, The Buoy Store is born! 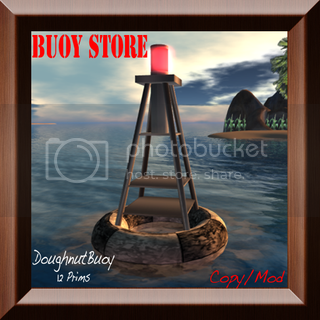 You can find the Buoy Store by taking the tp from Khargo. 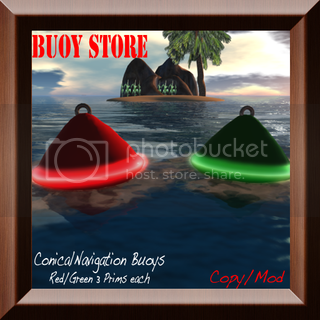 Once there you'll find a dock with all the buoys arrayed around it. All our buoys are equipped with a flashing light, a light spreading around 10 meters in the same color as the buoy, very slow rotation script, realistic moving foam and an ambient sound. We wanted to keep this simple so you dont have to activate any of these. We made the foam a separate prim so you can always leave it out if you dont like it. All you do is rez your buoy, place it where you want it, rez the foam and place this foam around your buoy. Easy as can be. And what a choice! 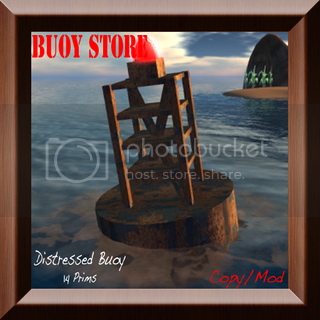 The updated, original, rusty, distressed buoy.